OK, BQB. Get a grip. You’ve got a half-hour left until East Randomtown is blown up. You need to complete this interview, then go save the day. Time is of the essence and you’re about to talk to a professional. Sure, J.M. Wilde is one of today’s top Australian zombie fiction authors, but that doesn’t mean you have to be a jerk and ask her about Australian stuff. She doesn’t want to talk about kangaroos, koala bears, or dingos. She doesn’t want to compare knife sizes a la Paul Hogan in Crocodile Dundee. Don’t ask her about vegemite sandwiches or if the Men Without Hats’ mandate to ostracize friends of your friends who don’t dance is still in effect over there. Just take all of your pre-conceived Aussie stereotypes and throw them out the window. The fans of the highly popular Eva series deserve no less. OK. The space phone is ringing. Clockwise or counterclockwise: which way does the water swirl down the drain in the land down under? Please. Go flush your toilet, take copious notes, then come back with a full report. I swear that’s all I’ll need to get all the curiosity about Australia out of my system. A. I actually have no idea. I’ve never really noticed, I guess counterclockwise? Flushing the toilet isn’t any help because most toilets here don’t swirl, they just flush down. I didn’t even know that myth existed until that one episode of The Simpsons when they came to Australia. Long story short – Halloween in Australia. Does anyone over there do anything to celebrate or is it just another day? Don’t worry if the answer is the latter. With all the goofballs running around in costumes and all the weight I gain from eating fun size candy bars, there are times I wish it was November 1 already too. A. This is an interesting one. Halloween is also connected to Samhain, which takes place in Autumn. Here in Australia, Samhain takes place on May 1st, so technically that’s our Halloween. But thanks to commercialization and the many American TV shows and movies we watch, Halloween has made its way here over the last few years and is celebrated more and more on October 31st. It wasn’t celebrated here at all when I was a kid, but I would have loved to have gone trick or treating just like all my favorite characters on TV. Now, I see more and more kids and teens knocking at my door in costumes, and more Halloween decorations being sold in stores. Halloween parties are becoming a thing, too, which is awesome as I love a good costume party! Q. Let’s talk about The Eva Series. In this three-book collection, you’ve turned Australia into one great big zombie infested death island. Readers follow the journey of Eva as she and her friends make their way through the madness in search of safety. I have to admit, this is a pretty unique turn for the zompoc genre. How did you come up with Eva’s story and what inspired you to tell her tale? A. It really started because of my husband. I’d never written fiction before and wanted to try it, and at the time I thought my husband would be the only one who would ever read it. He loves zombies, so I decided to write a zombie story. And seeing as we live in Australia, I figured it would be cool to write about what might happen if a zombie virus broke out here. And voila! 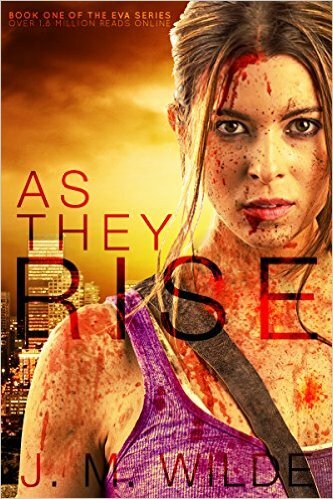 As They Rise, the first in the series, was born. Q. As I told a pair of writers the other day, I don’t have much pull in Hollywood. Sure, Taye Diggs follows me on Twitter but I’m pretty sure he hit the follow button by accident. That being said, “Zombies in Australia” seems like a concept ripe for a movie. On the off chance that J.J. Abrahams visits my blog by accident, give him your pitch as to why we need an Eva movie. A. Taye Diggs follows me too! Okay, here’s my pitch. Hey J.J (or other equally awesome Hollywood person), enough already with zombies in the U.S of A! It’s been done to death (Ha! Puns.) Let’s move the fun down under where the stakes are higher and the production is cheaper. I’ve got the story, you’ve got the skills and the connections. Let’s make movie magic. Q. OK, I don’t want to brag, but I have been known to attract as many as 3.5 readers to my blog. I thought that was pretty impressive until I learned that The Eva Series has racked up over 3 million reads online. How did you get so many eyeballs on your work and for any aspiring writers out there, what can they do to attract more readers? A. It’s all thanks to Wattpad. I don’t really know how it happened, but once I started uploading chapters to Wattpad a few years ago, it skyrocketed. I wouldn’t have ever considered being a pro writer without all the support from those early readers who kept begging me for more Eva. Aside from writing a good story and having a cool cover, I’ve found that being persistent and consistent is key when it comes to writing on Wattpad and attracting readers. Q. You’re a Wattpad star. For people who aren’t as hip as we are, Wattpad is an online site that allows users to post their works and receive feedback from other users. What about this site have you found useful and would you recommend it to other authors? A. I adore the hell out of Wattpad, and I definitely recommend it to other authors. I think my favorite aspect about it is the interaction with readers. I’ve made friends and get to talk to my readers regularly, gain feedback on my work and just have so much fun with them. Q. So what’s next for you? Any other book ideas in the works? Could the zombies attack your neighbors? Just going to throw it out there. I feel like “TaZmania” or “New Z-Land” are rife with potential. A. Haha! I love the New Z-Land idea. I’ve started working on a spin-off about one of the characters from book three, and I’ve been thinking about a potential fourth book in the series. But right now I’ve got a few other projects in the works; a couple of geeky YA contemporaries and a fanfic of The 5th Wave commissioned by Sony that’s being posted to Wattpad. Q. You’re a self-described fan girl. On your website, you talk about how you want to be Iron Man and have pictures of yourself in Marty MacFly’s “future wear” from Back to the Future II, in which you’re meeting Christopher Lloyd, the actor who played Doc Brown. I tip my hat to you, madam. You’ve dethroned me as the Internet’s most renowned poindexter. A lot of great superhero/comic bookish movies are coming out next year. Which one or ones are you looking forward to most? A. Meeting Doc Brown was definitely one of the best moments of my life. BTTF is my fave movie so it was surreal. He’s such a nice dude. To answer your question … All of them! Deadpool. Captain America: Civil War. X-Men: Apocalypse. Suicide Squad. The list goes on! Q. J.M., thanks for taking a moment to talk with me. Before I go, do you have any last minute advice that might help my friends and I survive the East Randomtown Zombie Apocalypse? A. As Eva learned the hard way, fire doesn’t work against zombies, it just turns them into undead fireballs. Running is always the best choice. If you can’t run like hell, fight like hell. And always follow Rule #2 of Zombieland: double tap. BQB EDITORIAL NOTE: J.M.’s running a Halloween sale! 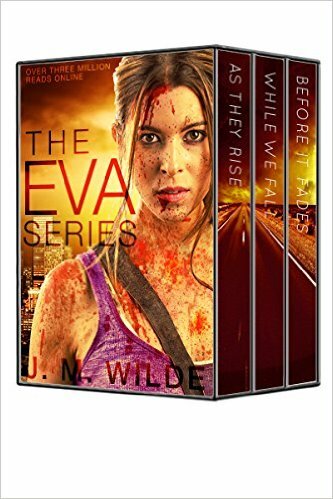 Get all three books of the Eva series for .99 cents! I enjoyed this interview with J.M. Wilde, Australia’s preeminent zombie book writer. Speaking of Australia, her books follow a group of survivors as they make their way through a zombified Land Down Under! Neat idea, isn’t it? Australia is one big island, right? Sounds like a place zombies could wreak a lot of havoc. 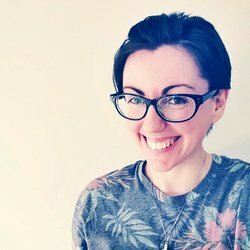 She’s got a lot of great advice in this video about how to get readers on Wattpad. Why aren’t you using Wattpad yet?